God I hated this movie. 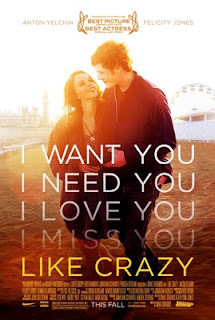 I hated it from the opening scene where kookily sweet English girl Anna (Felicity Jones) propositions goofy, nerdy American boy Jacob (Anton Yelchin) with a quirkily, goofily, cutesy letter under his windscreen-wiper. I hated the falling in love scenes - all reading each other's poetry and carving each other's names on a chair - adolescent crappiness - and the self-indulgent, stupid manner in which the girl screws up her visa application by over-staying her welcome. I had no sympathy for the couple. She just seemed selfish and juvenile - he just seemed weedy and pathetic. Her parents seemed unbelievably nice - why didn't they just slap them both round the face and tell them to get on with it? And as for so-called honest insights about the problems with long-distance relationships - jealousy, cheating, feeling left out, expense - frankly, there's nothing more profound in this flick than in the mainstream rom-com GOING THE DISTANCE. Just because you film everything in a ramshackle indie style; give it a score by Dustin O'Halloran; and neither of the lead characters ever wash or comb their hair, doesn't make a movie authentic or interesting. I really just don't get the hype it's receiving. It struck me as juvenile, self-indulgent and banal - just like its milquetoast lead characters. ENOUGH ALREADY! LIKE CRAZY played Sundance 2011 where it won the Grand Jury Prize - Dramatic beating TERRI, MARTHA MARCY MAY MARLENE and HERE. Felicity Jones won the Special Jury Prize for Acting. The version shown at London 2011 has been cut to achieve a PG-13 rating. LIKE CRAZY will be released in the US on October 28th and in the UK on February 3rd.